Baz Luhrmann’s The Great Gatsby is a rollicking, cinematically frenzied and inconsistent take on F. Scott Fitzgerald’s seminal novel. It is pop art done in the most extreme way, using what it likes from the source material’s Roaring Twenties setting and glossing over the rest with Lana Del Ray and Beyonce. This is why as an adaptation of what many consider to be “The Great American Novel” it fails miserably, but as a movie it is far from miserable. Fitzgerald’s novel is not a work of maximalism like this movie is. It is the story of parties ending, and of dreams and identities being born, shifting and dying. Luhrmann may have many of the more beautiful passages flash on the screen in fancy font as Nick Carraway (Tobey Maguire) narrates, but he is clearly more in tune with the party than the language or the themes of the source material. The lavish romps that Jay Gatsby (Leonardo DiCaprio) throws in order to gain the attention of Daisy (Carey Mulligan) are so hyper-stylized that their energy is contagious, though the characters’ emotions rarely match that. Each set piece is so overly art directed that it gives a contact high, but even great performers like DiCaprio and Mulligan can’t push it past a mostly surface level engagement. Gatsby is someone who on the surface appears to have achieved The American Dream in every possible capacity, but who secretly pines for the girl that got away. After World War I he rebuilt his image from a life of poverty into one of flamboyant wealth, thanks in no part to his illicit activities during Prohibition. DiCaprio channels some of that outcast sensibility simply by the way he uncomfortably looks at the other characters, notably Daisy’s arrogant husband Tom (Joel Edgarton). The major confrontation scene where Gatsby and Daisy confess their undying love and secret affair to Tom is one of the few times the movie actually feels a little subdued, even if the deep red wallpaper of their hotel suite dominates the scene more than any of the characters. If I had never read the novel, it would be hard to think I would walk away from this movie inspired to do so. The constant sense of pop ecstasy is tiring, if not as much as in Luhrmann’s Moulin Rouge!, which earned the exclamation point at the end of its title at least four hundred times over. 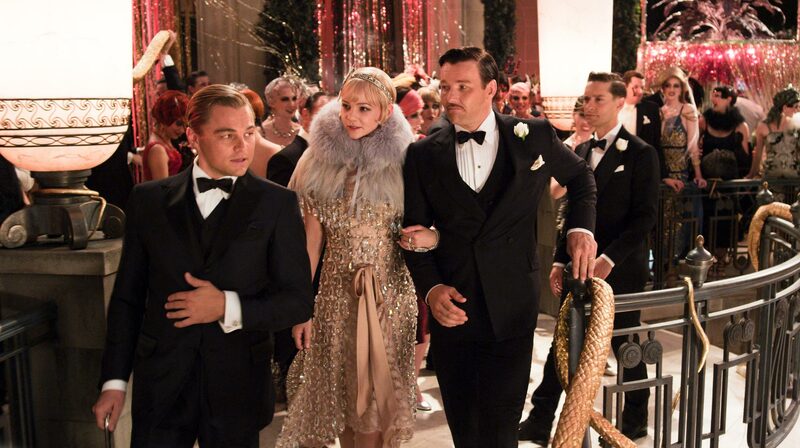 Gatsby, however, has the added advantage of being in 3-D, giving Luhrmann plenty of opportunities to hurl confetti and shirts in the air at us. Thankfully he doesn’t use that added immersion for any outright gimmicks or winks at the audience, though by the end of the movie I was more exhausted watching the green light flash on Daisy’s dock than Gatsby was. Luhrmann often seems to be at war with the material he is adapting rather than working with it. He isn’t so much paying homage to F. Scott Fitzgerald as he is trying to use his novel’s reputation to enhance his own. By tackling such an esteemed work (and being selected to open Cannes next week), he continues to try and elevate himself above pop escapism and closer to the level of art as these original authors, which he also did in the ’90s with Romeo + Juliet. It really doesn’t pay off, and though his worlds are at times visually enthralling, they’re also kitsch of the highest order. The Great Gatsby doesn’t lend itself well to this, but this is also one hell of an entertaining movie sometimes, too. This entry was posted in Reviews and tagged Adaptations, Bad Adaptations, Baz Luhrmann, Carey Mulligan, F Scott Fitzgerald, Great Gatsby 3D, Joel Edgarton, Leonardo DiCaprio, Literary Adaptations, Moulin Rouge, Romeo and Juliet, The Great Gatsby, The Great Gatsby review, Tobey Maguire by matterspamer. Bookmark the permalink.